Today's post was supposed to be makeup related but I have to re-swatch a few things before I can put it up, but it should be up soon! I do want to make a note that you can see how much of a toll that wearing the false nails have taken on my hands. I've not worn them in a week or so and I'm still struggling to get my hands and my nails back to being healthy. Or at least into a presentable fashion. I've not even painted my nails and that's sad. So do excuse the fact of just how gross my hands look right now. 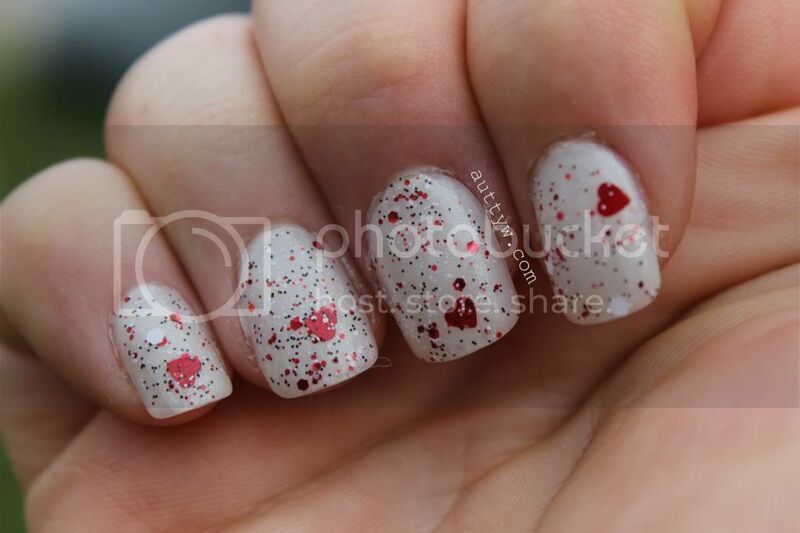 Honey Bunny Lacquer's Love Hate Love is from the Anti-Valentine's Day collection. 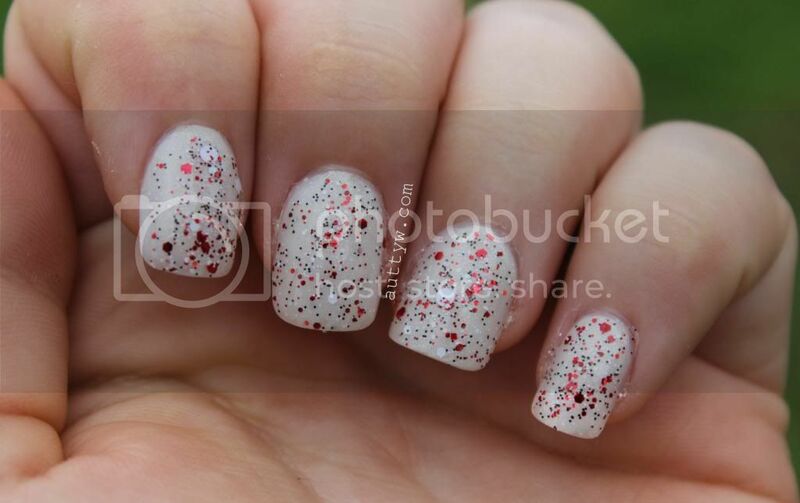 Love Hate Love is a glitter topper with matte white & black and red holo microglitter; white dots, matte white and red holo hexes; red micro slices; and red and black matte and red holo hearts. Now I purchased the Mini bottle, so what I'm going to say could be totally different if you purchase the regular size. I had to fish the hearts out of the bottle or I had to take them off of the wand portion. I only managed to get 4 hearts out of the bottle and those are the 4 you see currently. See, no hearts. I'm totally okay with it because it makes the mani itself a little more unique. While I do wish I could have gotten more than the 4 hearts out. The formula itself is a little thick as well, but it's very manageable. You don't need to sponge this on at all. I didn't have to go back into the bottle to get more on the brush, that is how much that comes out. I don't mind that this polish is thick because you do NOT have to work to get a good coverage except for getting the hearts but once again like I said up above I have the mini bottle so you could have a different experience with this polish then I did. I still love this polish and definitely am going to covet it! You KNOW I had to do an artsy fartsy picture for you! This is so pretty!! Bummer the hearts were super fishy. I like it with and without the hearts. I have noticed bigger glitters are harder to get out of the mini bottles, so maybe that's why? It's cute though!